We enjoyed a flying visit from Christalin Thangpawl and her brother, Kim, comparatively new 'kiwis' from Myanmar. Christalin talked to us about her role as chairperson of the New Zealand Myanmar Ethnics Council. Jessica Sebastian, a solicitor, and manager of the Porirua Community Law Centre, who spoke to us recently says she would love to see Rotary doing some joint projects or some governance training programmes for NZMEC to help them to achieve better grant outcomes. Christilan (a qualified nurse) and Kim are clearly keen, lovely and generous people. Christalin now volunteers 24/7 and makes a real contribution to the community. An important role is in managing their after school homework club with the help of volunteers. They would welcome our support on Fridays from 5.000-7.00 at the Salvation Army in Cannons Creek. If you could volunteer some of your time please let PE Donna know. President Jenny reported that Annie Grenfell has been accepted by the District to be an outbound International Youth Exchange student, probably to Argentina. She is a dancer and is really keen to get into the Latin American scene. She will need a mentor from the club so if you would like to offer, please see Donna. Annie is Ben Sawrey's sister and they will perform together at Changeover - something special to look forward to. President Jenny reported that she has heard from Rosie Darrah in Switzerland who is really positive and making the most of her year. She has got really stuck into her school work. She has just left her first host family who she was sorry to leave and has moved in with the second family. She is looking forward to the holidays and the big Euro tour. President Jenny asked for members who would like to order the navy blue jackets with the RI logo to let her know on or before next Tuesday as she would like to place an order. Hell Pizza in Mana has donated 4 x $40 vouchers as they inadvertently forgot to deliver pizzas to the Rotary Best Speaker Awards. These will be used as raffle prizes at Changeover. President Jenny is going up to Auckland next week to take some of the clothes that members have donated to our Fiji project. There is still one more week to fossick for more contributions before they go so bring any offerings along next Tuesday. She and Ron will be going to Taveuni in August with the solar water pump. Les is looking for two teams of 4 to enter an outdoor bowling competition at Naenae on Sunday afternoon, 22 September which is being run by Stokes Valley Rotary. If you would like to play in one of the two teams, please give your name to Les. The good news is that Noel is now at home and has an electric chair and is reunited with his technology. The bad news is that he won't be able to leave the top floor of his home for some time so visitors will be very welcome. It was great to see Graham Craig back and walking so confidently after his knee replacement. What’s coming up in June and beyond? 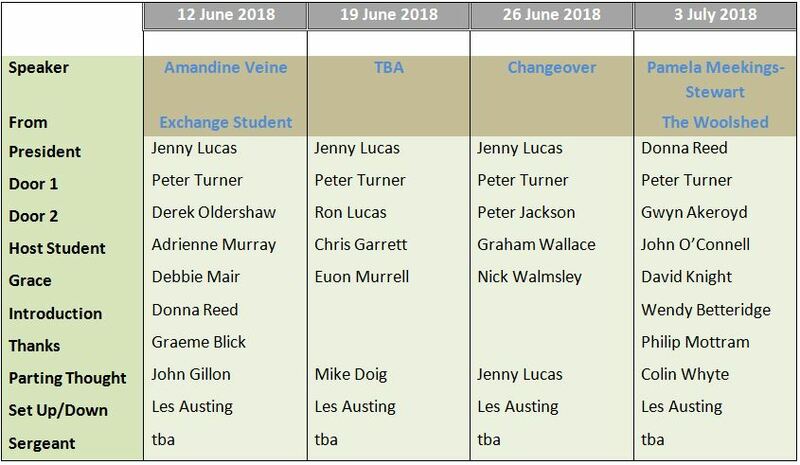 Next week on 12 June we can enjoy the final presentation from our own Amandine as she rounds off her year with us and prepares to return to France on 7 July. You will all have received your personal invitation to Changeover. RSVP directly to PE Donna or to the Professionals if you are going to be there (not the normal procedure of apologising). You can find information about all future events here. Although the 19 June meeting appears to be 'empty' watch this space as something may appear. 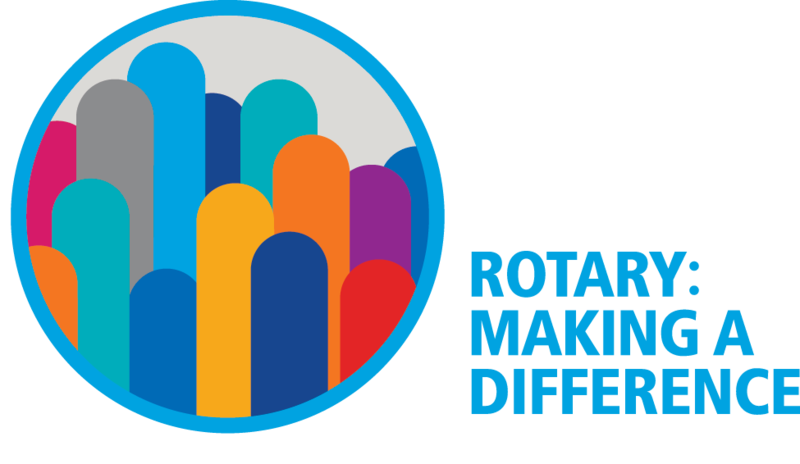 The first dinner meeting of the new Rotary year will be on 3 July. This is an apt presentation to start the new Rotary year with Pamela Meekings-Stewart talking to us about the changes that occur when the Pleiades star cluster appears in the morning sky in mid-winter and what that might mean to us. Les Callear gave us a quote from Groucho Marks about marriage, 'I have been married for 53 years. Marriage is like a deck of cards. All you need to start with is a diamond and two hearts but later on, you sometimes wish for a club and a spade'. It was good to see Honorary Member Jim Dearsly (although he's really part of the furniture after all these years). 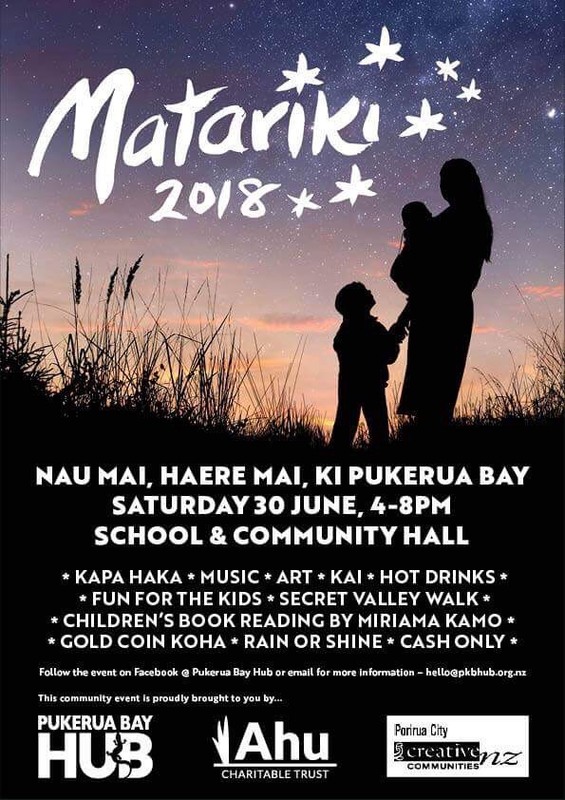 John O'Connell (ours) is looking for some volunteers to help him to support the Pukerua Bay Hub as they celebrate Matariki on 30 June from 4.00-8.00 pm at Pukerua Bay School and Community Hall and surrounding area. Central to the night is a much-loved star gazing walk to the 'secret valley'. Last year about 350 people went along. Please make contact with John if you can offer some of your time. If you didn't get your own copy of the May edition of the Our Porirua E-Newsletter, you can find it here. The June edition of RDU is now available. If you haven't received your copy, here it is. Denise Duke reports from Nepal that the classrooms they have been working on in the village of Ghusel are complete. The bamboo classrooms will now be pulled down so that the children can have their playground back as it's the only flat area in the lower part of the village. She sends grateful thanks for all our support. It's a small ask but it could make a big difference. Could you support our local Riding for the Disabled (at Battle Hill) by supporting SAM. If you read the article, you'll see that Sam is 'Dancing with the Stars' for RDA riders like Pippa, horses like Booms, and coaches like Claudia. Please don't wait until it's too late. Watch the show on Sundays at 7.00pm and Mondays at 7.30pm on Three. And please keep #TeamSam dancing for RDA. President-elect Donna has an update on the school building for Belola (part of the Balibo project). Work is progressing and contributions are now being sought for the roof. If you have an old suitcase on wheels that you could donate, please let Donna know. She will be going to Melbourne on 15 June and has heaps of 'goodies' that need to be transported. 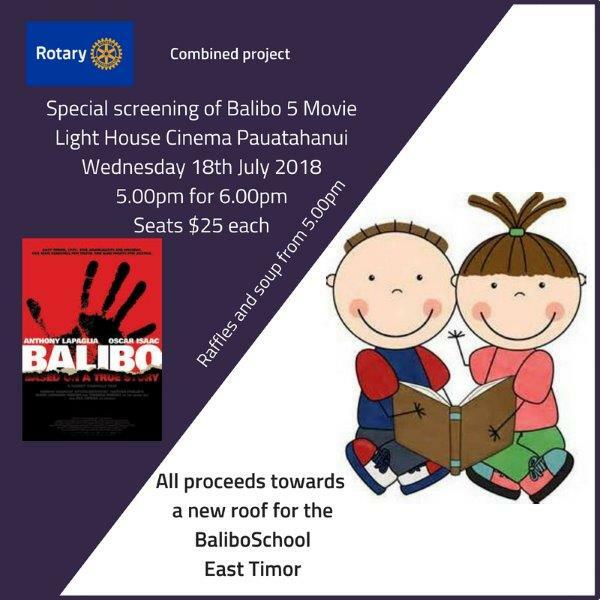 In order to add your contribution to the roof funding, come along to the Balibo movie fundraiser on 18 July at The Lighthouse in Pauatahanui. Tickets are $25 and there will be soup and raffles. Original generation time 1.7659 seconds.